Students carrying heavy school bags are a common sight around us. Much has been written about it. Almost everyone agrees that the weight needs to be reduced. Yet not much has been achieved in this direction. ANJU GUPTA, HEADMISTRESS, AHLCON INTERNATIONAL SCHOOL, shares with us some initiatives that the school has taken to address this issue. Carrying a schoolbag is a routine for most of the children and this has been a norm in the past century. However, the growing weight of school bag and its effect on children’s health is a seriously increasing concern of every parent and teacher today. In one of the surveys conducted by ASSOCHAM under its Healthcare Committee, it was found that 68 per cent Indian school children under the age of 13 years are likely to suffer from mild back pain, which may develop into chronic back pain, followed by a hunchback. The report also noted that over 88 per cent children, in the age group of 7-13 years, carry about 45 per cent of their weight on their backs. The findings also included startling facts such as, most students carry over 20 books, textbooks and exercise copies daily, together with sports kits and other equipments on certain days. Keeping our children’s future in mind, our school management recently sent a note to parents in which we talked about the importance of reducing school bag weight. The circular requested parents to replace big water bottles, weighing more than 2 kg when filled up to brim, with water tumblers. And if at all, big water bottles are to be sent, they should be half filled. The children could refill these bottles at school itself. The note further urged parents to either personally pack the school bag strictly as per the time table or oversee what your child has stuffed into their bag. It’s generally seen that working parents do not have enough time to pack their ward’s bags, thus leading to presence of all books and notebooks in the bag throughout the week. This being a convenient option is followed by most of the parents without thinking about the effects of such heavy bag on a child’s physique. The note further emphasised that bags would be checked periodically and concerned parents be called to school for further discussions/ counselling. The note comes in the wake of HRD ministry’s recent directive to reduce the weight of the school bag which has prompted schools in NCR to take measures in this direction. After the Centre’s directive, the Delhi government fixed the weight of bags, putting a cap of 1.5 kg for classes 1-2; 2-3 kg for classes 3-5; 4 kg for classes 6-7; 4.5 kg for classes 8-9; and 5 kg for class 10 onwards. Our school has always tried to promote light weight bag but was unable to implement it fully because of the concern of some parents. However, after conducting an exercise of weighing bags in school, it was found that the empty bags alone weigh 2-3 kg. So the weight of the bag after putting book/notebooks, one litre water bottle filled with water, tiffin, etc., can only be imagined. It’s thus very obvious that both parents and schools have to jointly work towards finding a solution to this problem. The need for reducing the excess weight that children carry on their backs has been debated for quite some time. Our society is going through a lot of change. Children don’t have enough open spaces to play, exercise and have fun. The attraction for indoor games and electronics turns these children sedentary. Result –weight fluctuations, low muscle strength and poor physical tolerance. Childhood is a time to learn and have fun. Academics should not overshadow health. 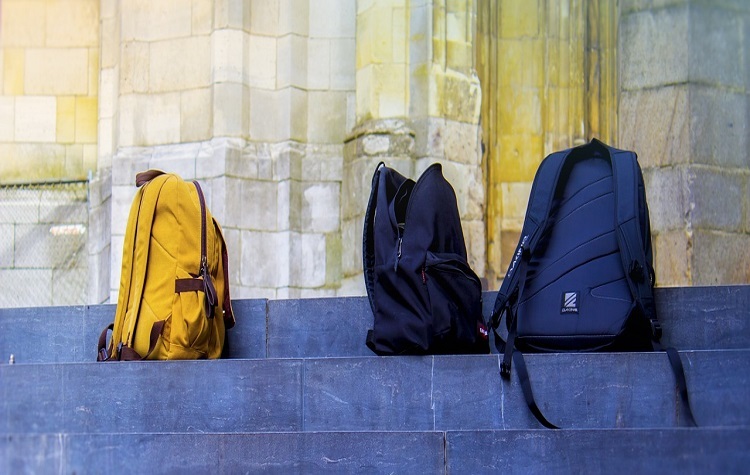 Carrying a larger-than-required school bag puts an unnecessary stress on a child’s back, affecting his/her musculoskeletal system adversely — more so, if a bag is carried on one shoulder. However, the government has now issued strict instructions to schools, which are being passed on to parents for the welfare of our growing children. All stakeholders of education have to join hands to face this gigantic problem. Some innovative measures have also been tried by many institutions but not to desired effect. Fixing of ‘No Bag Day’ in a week, provision of lockers in classes to enable students to keep their books/notebooks in them, providing handouts to students for important topics, replacing normal bags with trolley bags, sending special free vans to designated areas to pick and drop the school bags of students and above all, providing e-learning platforms to students with BYOD (Bring your own device) are some of the innovative ways used in different areas for dealing with this problem. While there has been slow and steady progress, we are confident that the government initiatives, and technology along with new age learning methodologies will help children lead a normal fun-filled school life without having to carry heavy school bags.